Game description: Hit the court with NBA superstar Paul Pierce and other basketball heroes as kids-Shaquille O'neal, Allen Iverson, Tracy McGrady, Yao Ming, and more. Full court basketball sim with arcade action, Backyard Basketball 2007 features spectacular new graphics, interactive backgrounds, and realistic gameplay with season mode, stats, minigames, unlockables, and tons of surprises. 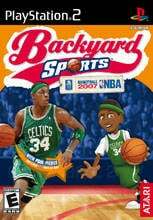 The best selling kid's basketball videogame of all time, Backyard Basketball 2007 is the only one to hold the National Basketball Association license.